Planet crafts usually involve a bit of time and effort. Most craft projects center on recreating the entire solar system in some fashion. If using the craft project as part of a series of classes, a planet can be added to the project as each planet is talked about. A solar system model is perhaps the most popular of all planet crafts. Plan on taking a little time each day during the course of a week when working with a large-scale project like this to allow for paint drying time. Styrofoam balls in various sizes are used to represent the planets and wires of different lengths fasten them to a large ball that represents the sun. This standard project can be slightly altered to become a mobile. The "sun" is placed at the top of the mobile and the "planets" are suspended from it with string. The string can be held in place with tacks. For either project, be cautious that little fingers don't get poked by wire and needles. For wearable planet crafts, beads can be used to make necklaces or bracelets. 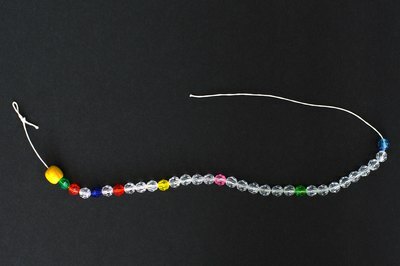 Plastic seed beads work well for school-age children. Look for beads with approximately these measurements: 3mm red, 6mm yellow, 6mm blue, 4mm red, 12mm orange, 11mm yellow, 9mm green and 9 mm blue. These beads can be strung all in a row or, to make a longer string, black or white beads can be used between them to represent the space between the planets. Plaster of Paris is excellent for creating planet-like objects. Use a slightly deflated balloon that is close to round. Mix the plaster of Paris according to package directions. Dip strips of newspaper in the plaster and wrap it around the balloon until it is covered with several layers. To create craters for Mars, dip bubble wrap into the plaster and wrap it tightly around the balloon and newspaper strips. Tape into place. Once everything dries, pull off the bubble wrap and it should leave "craters" behind on the planet. Use this same concept with bubble wrap pressed into a bowl or cookie sheet filled with plaster of Paris to create a close-up of Mars' or the moon's surface. The dried plaster can be painted any color you require. 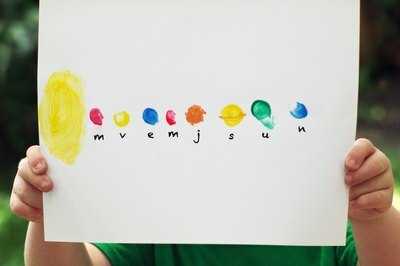 For preschoolers, a cute solar system can be created using fingerprints. Use non-toxic finger paints and heavy weight paper. Black paper works best if the paint colors are bright enough to be visible against it. Use the pinky to create a red dot for Mercury, the ring finger with yellow for Venus, the ring finger with blue for the Earth, the pinky with red for Mars, the thumb with orange for Jupiter, the thumb with yellow for Saturn, the middle finger with green for Uranus, and the pointer finger with blue for Neptune. Draw in rings for Saturn using a marker or crayon and allow the child to create the sun by dabbing yellow paint onto the paper with a large circular sponge. A cute planetary mnemonic phrase like "My Very Educated Mother Just Served Us Noodles" can be written under the fingerprint planets to help identify the planets.